"I made this for you at school, Mom." "Wow. Thanks, honey. Will you tell me about it?" 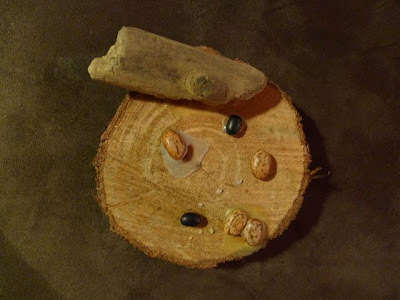 "It's a nature-project-thing with beans and glue and wood." "And lightning. There's lightning too." This spring, I will have the honor and pleasure of directing the May 1st, Listen To Your Mother show in Los Angeles. If you aren't already familiar with the show, you can read more about Ann Imig's fabulous brain-child here. Information about the Southern California auditions can be found here. I will post ticket information soon. Looking forward to meeting you! So sad I will miss Listen to Your Mother! I know it's going to be amazing. I hope there will be a link of some sort later--I really enjoyed the one I saw previously. Maybe I will have my sister go. . . So glad I got to partake in that gnarly (literally) piece of original artwork. Nice. Lightning and all! The boys and I also found that nature is so much prettier with a crapload of gluegun glue. That is some serious gluing! How incredibly cool about LTYM! I had not heard of it before, but will be sure to watch the video from that link. Sounds incredible. Now you all need to get some East Coast dates in there! Love the ART!!! Of course I will be at LTYM!!! How I admire your tact and diplomacy, "tell me about it." I am going to have to remember that for future art project moments!